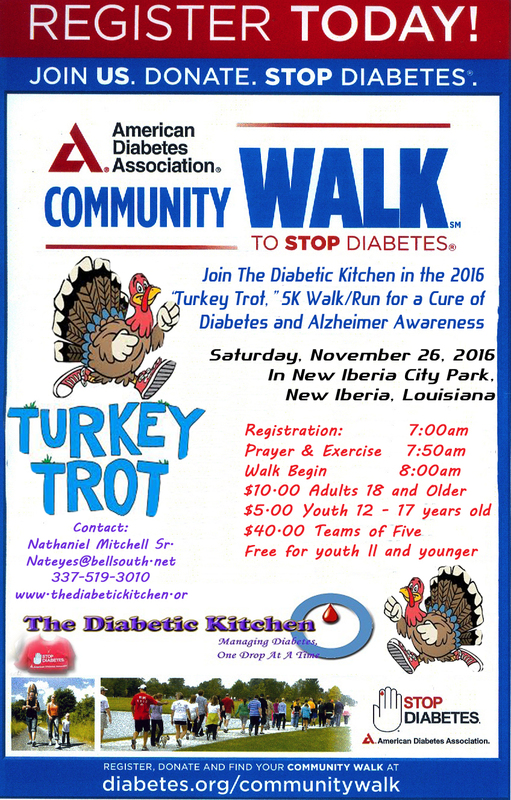 The members of The Diabetic Kitchen will host the 2016 “Turkey Trot,” 5K Walk/Run for a Cure of Diabetes and Alzheimer in New Iberia City Park on Saturday, November 26, 2016. The event will begin with Registration at 7:00 am, we’ll have an Opening Prayer, then Warm-up Exercise beginning at 8:20 am, with the event beginning at 8:30 am. Fees: $10.00 for Adults 18 and Above, $5.00 for Youth 12-17, $40.00 for teams of five, and Free for Youth 11 years old and younger. If you are not able to attend the event you can make Donations Directly to the American Diabetes Association at www.diabetes.org/communitywalk, click on Join a Group, then find the Louisiana-Turkey Trot, follow prompts from there.